Want to do some early holiday shopping? This Saturday there is a holiday boutique at SeaCliff Country Club. 11am-3pm. It is hosted by Finding Something More – an organization helping to inspire women to look beyond their circumstances. They put on events designed toward personal growth and development as well as events geared toward helping charitable organizations. The boutique this Saturday is also a luncheon and there will be special vendor exhibits (get those stocking stuffers) as well as raffles and opportunity drawings. Get your tickets early and it is only $30 ($40 at the door). This is always a very nice event and for a very worthy cause. www.findingsomethingmore.com. More holiday shopping will be following weekend at Old World Restaurant, Nov 27 from 10am-4pm. There will be up to 50 arts and crafts vendors, live music, and German food throughout the beer garden and festival hall. You are sure to find some great stocking stuffers and gifts at this one. More for worthy causes: mark your calendar for the 14th of Dec for the Waggin' Trails Holiday Party at the Waterfront Hilton, 6-9pm. For only $35 presale ($45 at the door), you will be treated to a wide selection of fine wine, craft beer, hors d'oeuvres, desserts/chocolate & live music, raffles, silent auction. And the best part of all you can bring (if you have one) your 4 legged "fur-child" – we hope dressed in their holiday best. Valet parking will be available for $3. Come out and help support Waggin' Trails Rescue Foundation and all the work they do to save the lives of dogs on "death row". Tickets and info at www.waggintrails.org. Hope to see you there! Need more to do with your dog? You have two chances to visit Top Dog Barkery and have your pooch photos with the Surfin' Santa Paws!! Nov 27, 1pm-4pm and Dec 4, 12pm-3pm. So what does your pup want for Christmas? Let them tell Santa Paws! Top Dog is located in Pacific City on the lower level on 1st St under Equinox. While at Pacific City make sure to check out the super cute Santa set up in the middle of the lower level, complete with Santa's airstream trailer! It is set up now, but Santa will make his official arrival this weekend, and there are lots of dates you can pop in to get your photo with Santa. The schedule is at: www.gopacificcity.com/santa-photos. Looking for some tree lighting? This weekend there will be two. The first one is Saturday night (the 19th) at Bella Terra for the Annual Tree Lighting. 6-7pm. Enjoy hot chocolate, falling snow, music & song and special surprises. The first 200 guest receive a complimentary santa hat and jingle bells!! Santa will be arriving and available for photos beginning at 7pm. Then on Sunday there is the Miracle on Main Street from 2-7pm downtown HB. Main street will be closed to cars and filled with entertainment, holiday craft vendors and free refreshments. Santa arrives at 6pm for the tree lighting at that time. And finally, the following Sunday (the 4th) is the Light a Light of Love Pier Lighting Ceremony. 3pm-7pm. This one begins with a parade down Main St from Orange to the Pier. There will also be entertainment at Pier Plaza and a Taste of Main on Main St, ending with the snowflake lighting. Yep, plenty to do!! In the meantime, I hope everyone has a wonderful Thanksgiving, and I'll make sure to get more posts out with additional holiday fun stuff to do. If you are looking for a nice dinner out tomorrow, the 26th, check out what is in store at That's Amore Italian Restaurant in Peter's Landing on PCH. 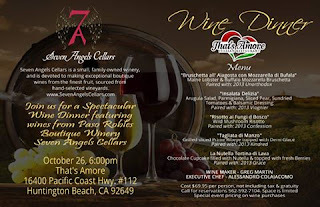 They are offering an Exclusive Wine Dinner - featuring 7ANGELS CELLARS, a Boutique Wine from Paso Robles. It is $69.95 with Special Event pricing on wine purchases - The tasting is guided by the wine maker himself - Greg Martin along with cuisine prepared by Executive Chef, Alessandro Colaiacomo. Call for reservations: 562-592-7104. Also, for all your Halloween fun, make sure to hit downtown on Monday,,, there will all kinds of activities for the kids from- 4-8pm,,, on both Main Street & 5th. Including a costume contest for the kids and the canines! don't miss this super fun family friendly event. So you all know I have a love for Pacific City – have you been there lately to check out what is new? Lot 579 is now open! If you didn’t know, it is named after Lifeguard Towers 5, 7, and 9 and covers everything from gourmet sandwiches to ocean-to-table seafood, fish tacos to Australian meat pies, cold pops & homemade ice cream to champagne. Here is a list of places now open: Bear Flag Fish Company, Burnt Crumbs, Hans Homemade Ice Cream, Popbar, Portola Coffee Lab, Pie-Not, Petals and Pop. And soon to open will be The American Dream (superior burgers & 60 craft brews), Frosted Cupcakery (out of Belmont Shore), Il Barone Italian Street Food (pizzas, pastas, & more), Mahogany Smoked Meats (beef, turkey, elk and bison jerky). Also, now open is the Bungalow – pretty cool looking place with an eclectic design, quite the hangout. They will be offering a wide range of signature cocktails as well as serving food from Bear Flag (sent via dumb waiter). Soooo…. You also all probably know how much I love to support Waggin’ Trails Rescue Foundation (with our signature Wags-n-Wine event and more), now I have an easy way you can also help save the lives of some dogs – shop Amazon! Yes that is right, if you shop on Amazon (I know many of you do), simply to to https://smile.amazon.com instead of the regular amazon.com. All the same prices, everything is identical. On your fist visit to smile you pick your charity – please pick Waggin’ Trails – so when you make a purchase, a donation goes to Waggn’ Trails. And all future purchases will also donate to W.T. automatically. W.T. really needs the help, they are now doing two transports a month, saving 30-50 dogs/month. That definitely adds up in costs. Please check it out. A suspected $126 million telemarketing scheme uncovered by Huntington Beach investigators led authorities on Tuesday morning to arrest 21 people accused of defrauding small businesses and charities by selling them overpriced toner for printers and photocopiers. Thank you Leonard at Surf City Copiers for sharing this information!! Something small businesses should be aware of! Just about everyone I know has been touched by cancer in some capacity, so consider coming out to join us. On that facebook page, you will see the schedule for the day regarding all that is going on. Lunch and dinner being cooked by our very own Huntington Beach Host Lions Club (accepting donations which go to the Relay), lots of live music, and fun themed laps. Please try to come out and show some support. Tell others! A week from this Saturday (May 7 from 1-6pm) is the Therapeutic Riding Center annual fundraiser and BBQ at the Red Horse Barn at the Equestrian Riding Center (18381 Goldenwest St). Silent auction, parade of the riding center's athletes, hat contest and free face painting are planned. $5 children, $10 adults. For more info:www.trchb.org. And when you are done there, on the same day you can head over to the Seacliff Country Club for the Project Self Sufficiency annual Wine, Cheese and Chocolate Please fundraiser from 6-10 pm. This year includes a sit down dinner plus all of the usual distinctive wines, decadent chocolates, gourmet cheeses, live music, auctions and more. Get all the details and tickets at www.winecheeseandchocolateplease.com. Have you been to Saint Marc over at Pacific City yet? They happened to have won 1st place at the Taste of Huntington Beach this past Sunday in the appetizer category for their bacon wrapped dates and watermelon skewers. I can tell you, I personally had to make a few visits to their booth because it was so good. So, speaking of bacon, they now have opened their To-Go-Bacon-Bar. For the ultimate grab-n-go experience, they offer 11 signature flavors of bacon 'buy' the slice which can be ordered to-go at the special bacon bar door. Signature bacon flavors include: Nueske’s Wild Cherry, Garlic Parmesan, Paprika Slanina, Benton’s Country, Tender Belly Maple, English Style Back, Zoe’s Applewood Uncured, Apple Pie, Tender Belly Habanero, Nueske’s Double Cut, Coffee Rubbed – If you love bacon, this is sure to make you hungry. Besides Saint Marc, there are so many other establishments at Pacific City worth a visit. Great restaurants and wonderful shops. A must visit if you haven’t been there yet. I’m a huge fan.